Gorgeous, sublime, rare “Flame Mahogany” Case, Steinway Model L, 1945, all mint original parts, beautiful furniture is surpassed only by the incredible instrument that it is. Everyone is marveling at this one, the wood grain, condition of the finish and the rich, sublime quality of each note. Been with one family on Long Island since 1945. Served as family heirloom, never played, hammers barely have a groove on them. Action just regulated, original perfect ivories. If you have been looking for that special Steinway this may be it. A Steinway amongst Steinways, one for the ages. Soundboard, bridges, pin block, hammers, strings, dampers all in excellent condition. This one won’t last long. Questions? Call Sonny Direct at 631 475-8046. Comes with warranty. Free LI/NYC delivery. All else continental USA only $475. for delivery and set up in your living room. Gorgeous, rare, tiger mahogany, Steinway Grand Piano Model M with Louis XV Legs and decorative case, 1960, one owner, piano action just regulated, case just french polished. Great sublime Steinway tone and unique art case. Comes with Warranty. Free LI/NYC delivery. All else continental USA only $475. for delivery and set up in your living room. Questions? Call Sonny Direct at 631 475-8046. Gorgeous Art Case Winter Baby Grand Piano, beautiful decorative French Legs and case. Circa 1955, rarely played, served as a furniture piece. Winter pianos were great American Hand Crafted pianos made in NYC. 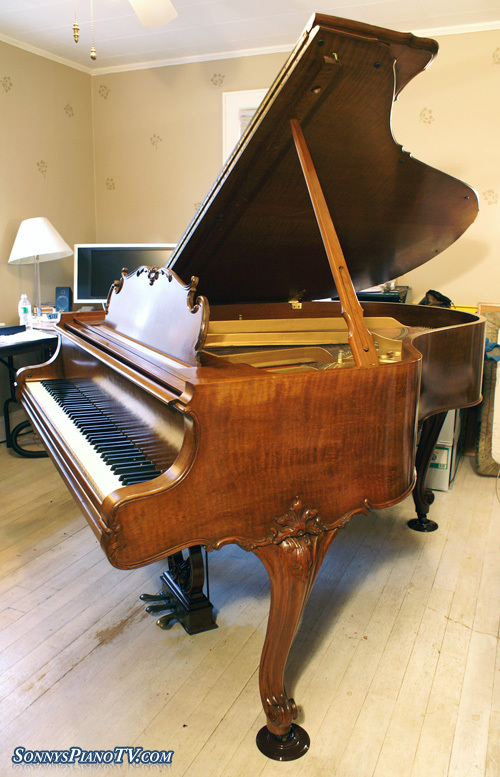 This one is 4’10” and just received a French Polish (several coats of hand rubbed varnish applied over the original finish to give the case an even sheen and a like new appearance)and has the action just regulated (take action apart and align and shape hammers, adjust springs and let off, polish capsans, shape knuckles and perform other mechanical adjustments so piano is responsive and pleasurable to play. Piano Comes with warranty. Free LI/NYC move. Only $475 for delivery and set up everywhere else continental USA. We also deliver to Canada and Alaska (price varies) Questions? Call Sonny Direct. 631 475-8046. A grand piano deluxe, Schumann Hi Gloss Grand Piano, mint condition inside and out. Served as funiture piece. Very little mileage. Schumanns are made by Samick Piano Company and were brought into this country by Joe Rosen a Piano store dealer and music store owner from Patchogue, NY. He became the national distributor for Samick and the Schumanns. The pianos were prepped and redesigned by local retired Steinway technicians. So Schumanns are great instruments and have a great tone and action response. Comes with warranty. Questions? Call Sonny Direct. Free LI/NYC delivery. All else continental USA only $475. for delivery and set up in your living room. Sonny’s Piano TV – Sohmer Grand Piano “Cupid Model” 5’5″ Walnut – See Video Tour! Sonny’s Piano TV – Kawai Ebony Baby Grand Piano Model GE1 – See Video Tour! 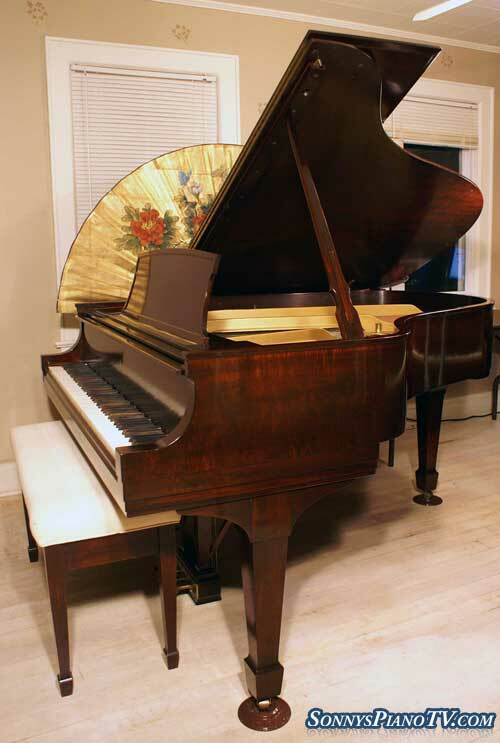 Gorgeous 6’1″ Art Case Fischer Grand Piano. Victorian style legs and lattice music desk. Exotic African Mahogany and appears to have some Tiger Mahogany as well. Looks and plays like a Steinway Model A especially the cast iron plate, the shape of the case and the 3 large support beams below the piano. Made in 1900. Original parts in amazingly excellent condition, beautiful perfect ivories look like they just came from the factory. From all appearances was rarely played and served strictly as a furniture piece. Just received a French Polish and action was regulated. One family piano came from the estate of David H. Miller, a major in the civil war and a Manager for Gilbert & Bennett factory in Georgetown, Connecticut. More details of history to follow. Warranty and Free Long Island/NYC deliver. All else continental USA only $475 for delivery and set up in your living room. Questions? Call Sonny Direct 631 475-8046. Sonny is confident that “everyone can play the piano” even without having to learn how to read sheet music and his DVD kit shows people how to “Play Piano Instantly” ($10 off with promo code “NEWS”). The program is geared toward helping people connect with their own inner musician. The DVD teaches you to play the piano using your natural musical instincts and has a special focus on relaxation and reduction of performance anxiety. The innovative SonnysPianoTV.com even provides on-line piano lessons with Sonny! When you purchase five lessons, mention promo code “NEWS” to receive one FREE lesson.